I have very few “rules” about food, but I have a rule against boring salads. It seems such a waste to eat a sad salad! 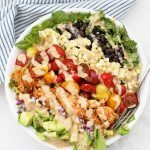 There are so many delicious combinations, amazing dressings, and flavor profiles to explore that I think there’s no reason a salad can’t be the most delicious thing you eat all week. That’s especially true in the summer, when fresh produce is at its peak, and everything tastes so bright and sunny. For one thing, I love that I can use leftover cooked or grilled chicken (or a rotisserie chicken!) for this, which means I don’t even have to turn my oven on to make it. If there’s one thing I love on a hot summer day, it’s NOT standing by a hot stove or turning on my oven to add to the heat. Salads, whether they’re grain-based or greens-based, are a perfect way to tackle dinner on a hot night! 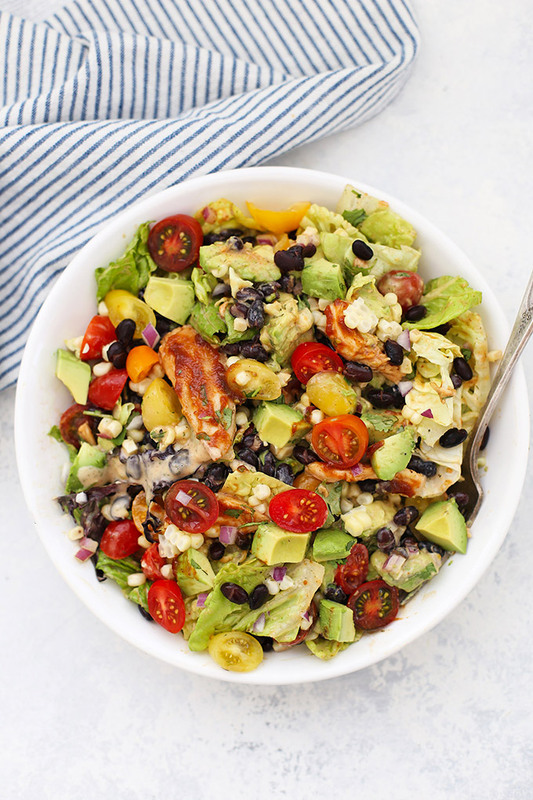 Then, there’s the summery combination of veggies–fresh corn, black beans, tomatoes, etc. The vibrant colors, textures, and flavors are all so good this time of year! Tie all that veggie goodness together with a creamy BBQ ranch dressing, and I’m in heaven. The combination is just so satisfying. It’s easy to mix and match veggies here–you can mix in some diced jicama or cucumber, or stir in some bell peppers, for instance. Or, you can add some chickpeas, bacon, or some hard-boiled egg to kick the protein up even more. You could even get fancy and swap out the grilled/rotisserie/cooked chicken for some crispy gluten free chicken tenders for a treat. 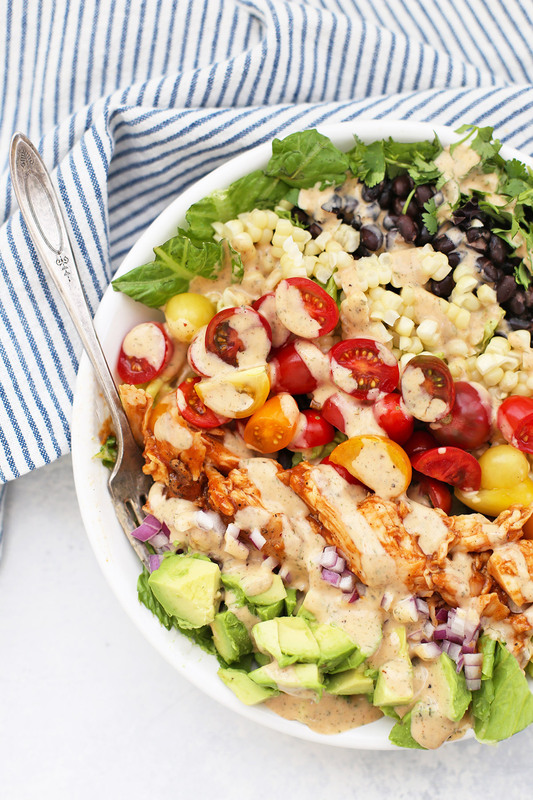 Whichever goodies you decide to toss in, I think you’ll agree that this BBQ Chicken Salad is summer on a plate. Friends don’t let friends eat sad salad! Change it Up: There are so many yummy veggies you can add to this salad. Jicama, bell peppers, snap peas, celery, and more are all delicious. You could also swap out the chicken for BBQ Chickpeas, or add in some diced hard-boiled egg if you like. If you’re not dairy free, a little cheese could be delicious here, too! Paleo-ize it! 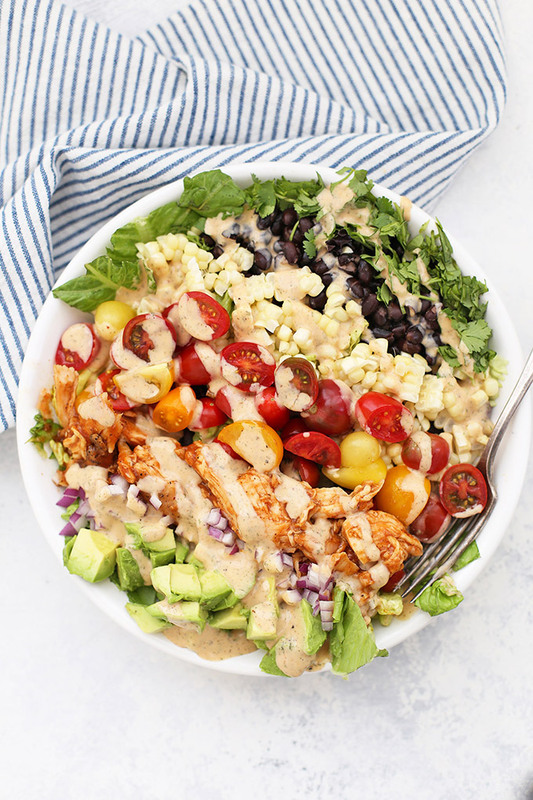 To make this salad paleo, you can swap out the corn and black beans for other veggies (jicama, cucumber, bell peppers, and celery are nice!). Then, you’ll want to make sure you’re using paleo-approved ranch (I love this one!) and barbecue sauce (like Tessamae’s or Bone Suckin’ Sauce). You can even make your own Paleo BBQ sauce if you like! In a small bowl, stir together chicken and 3-4 Tbsp BBQ sauce (enough to coat the chicken). 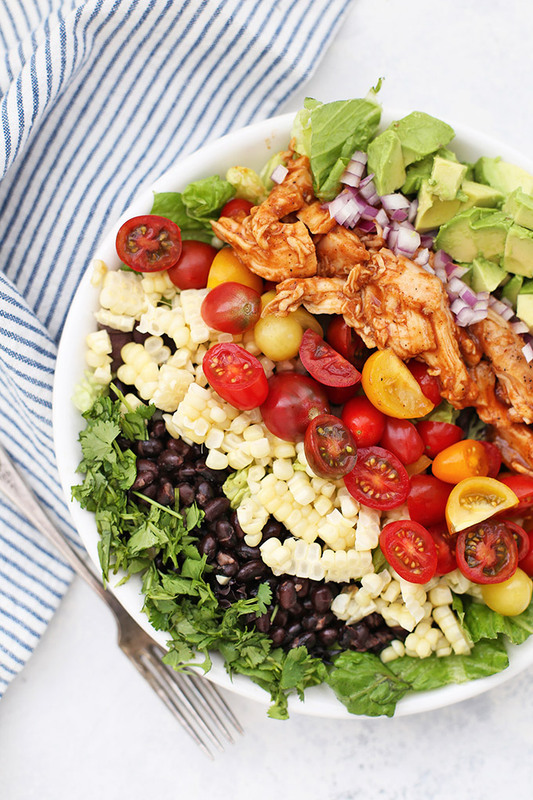 In a large bowl, mix together greens, BBQ chicken, black beans, corn, tomatoes, avocado, red onion, and cilantro. In a jar or bowl, whisk together ranch dressing with BBQ sauce. Taste and add additional BBQ sauce as desired. Store in the refrigerator up to 1 week. Change it Up: There are so many yummy veggies you can add to this salad. Jicama, bell peppers, snap peas, celery, and more are all delicious. You could also swap out the chicken for BBQ Chickpeas, or add bacon, or some diced hard-boiled egg if you like. If you’re not dairy free, a little cheddar cheese could be delicious here, too! Paleo-ize it! 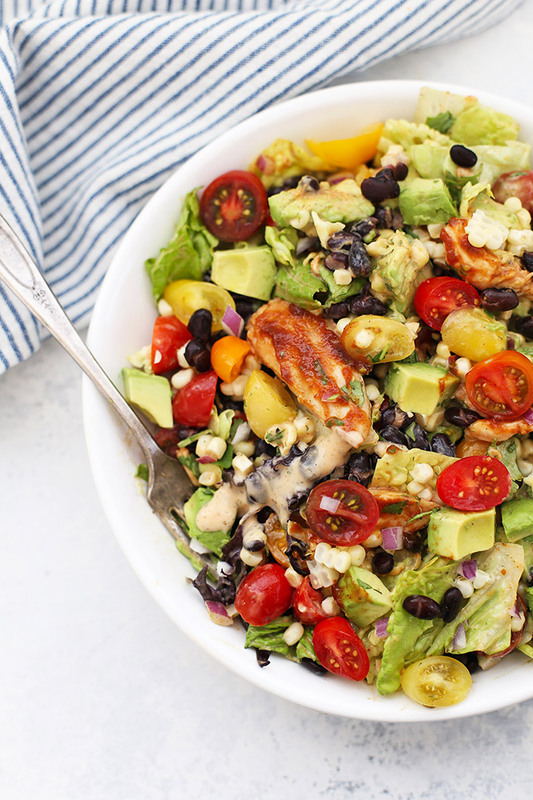 To make this salad paleo, you can swap out the corn and black beans for other veggies (jicama, cucumber, and bell peppers are nice!). Then, you’ll want to make sure you’re using paleo-approved ranch (I love this one!) and barbecue sauce. You can even make your own Paleo BBQ sauce if you like! Originally posted July 2012. Re-tested, re-photographed, and updated June 2018. Wow. I need too make this ASAP!! I LOVE Cheesecake Factory! I think this is a salad I could get my husband to eat as a meal, especially if I get a little heavy-handed on those onion rings 🙂 Mmmm. Good things today is grocery day! Make this again tonight! Husband just requested some nice crusty bread to go with it this time which I have no problem with. LOVE this recipe. This is amazing! I need to make this! Oh, this looks so yummy and refreshing! I need to make this one soon! I like the idea of fried onion strips as well as the original. Thanks for sharing such great recipes! This made a very tasty salad, and the dressing is delicious! Thanks! This is one of my go to salad recipes. I love your dressing recipe (didn’t try it yet), and I’m going to make your dressing next time I make this salad. I also make this as a potluck dish, but I layer the ingredients (mimicking the 9 layer dip), and I used a thicker dressing to layer towards the top. I put black beans & mexican blend cheese on top of the dressing and then the onion rings. For a party I use the French Onion Rings, for home I make homemade or the Alexia brand too! I love homemade salads. I read through all the ingredients and this sounds like my kind of salad, minus the avocados. I will add some jalapeno juice to the dressing to give it a little kick.